Cats break more stuff inside and outside your home than dogs. Felines that you do not own can take a liking to your garden and actually dig it up in patches. You needn’t shoot the pet because they’re only doing what’s in their nature, but you can keep them away using special methods that will not ban you from neighborhood parties. Water actually works. There are several theories in the pipeline concerning water as an ace cat repellent. 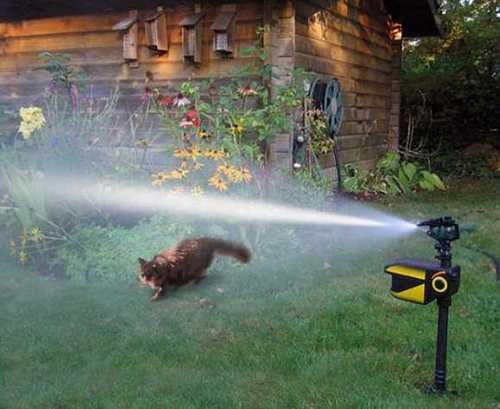 Some cats like the water, and are even willing to get wet, but a sudden spray can always spook them. They run from it and remember where the scare happened. Some people might say water is a no-go because cats will get used to it, but their instincts will win over their desire to use your yard as their own personal playground. Sprinklers with motion sensor to deter cats are a smart investment. They save resources and work only when they detect a special kind of movement in the garden (and if it is in range). There are several products out there, our recommended pick being the Contech CRO101, a "scarecrow" cat repellent that sprays water in a wide arc covering a large area. You can opt for commercial products to resolve your cat problem. We are not talking about poisons but repellents: there’s a difference. Grannick’s Bitter Apple is safe to lick but terribly sour. People have used this on their own pets to keep them from licking or biting a spot on their bodies or turn them away from a certain place. You can also scare felines using just air, specifically compressed air. There are devices with motion detection and a range of several feet, like Innotek's Multivet Ssscat Kit. 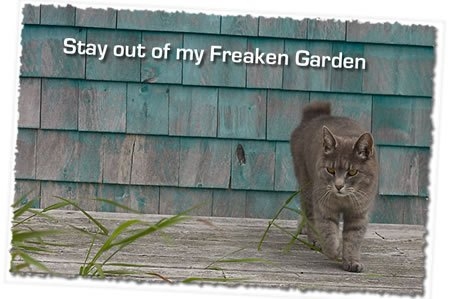 Harmless, odor-free, and effective as scare-tactics go, this can-based product is great against felines who have taken an especial liking to your flower spreads. You can also use mothballs to turn cats away. Since it is toxic, mothballs should be put in a covered jar or can and placed in places out of children's reach. How to keep cats away? Plants can work marvels! It’s a strange symbiotic win-win scenario: you not only diversify the plants in your garden, but also keeps unwanted cats away with those plants. Prickly plants are a great bet. Some of them look good in your garden landscape while doubling as cat repellents (even keeps away foxes, dogs, and actual intruders). Bushes in this regard include: blackthorn, hawthorn, blackberry, barberries, and holly. Odoriferous plants that work against felines include: lavender, lemon balm, rosemary, and curry herb. Find ground-covering plants like geraniums so cats do not see an open patch and think it’s alright to poop in it. Using infrared fields, these devices detect motion and emit a high-pitched alarm that though you won’t be disturbed by at all, the same can’t be said for cats. You can place them at strategic points and watch as cats run away quickly simply to avoid the frustrating decibel attack. You can use these in any weather, though colder climes will demand regular battery replacements. 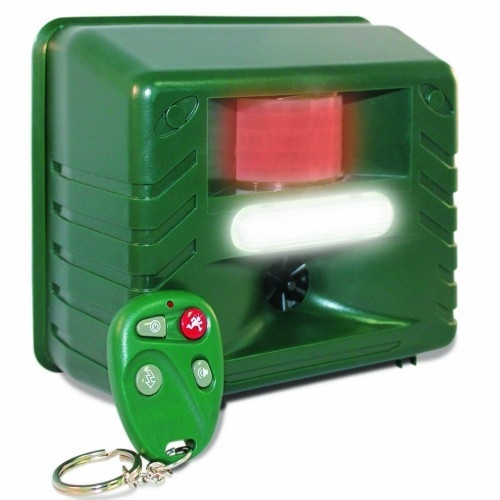 Our recommended product in this category is the Yard Sentinel that can safeguard a 4,000 square foot radius. 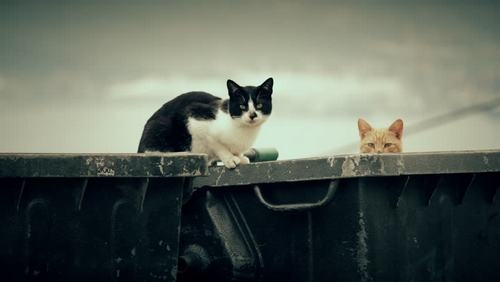 Cats gather at trashcans, not for social reasons but to grab leftovers and sometimes even engage in loud caterwauling fights for food. If you keep such attractants in or near your garden, repellents are pointless. Keep bin lids securely sealed and see that all garbage is inside the bin. Ensure nothing peeking out in any way to tell cats to come hither. They will even try to open these bins, which is where tight fitting lids come in handy. How to keep cats away from your garden? Talk to your neighbors and let them take care of their cats because if a cat finds it difficult to go to their owner’s, they will settle for the next best thing. If your garden or yard has a shelter good enough to house a kitty-cat, they will definitely take advantage of it. Old barns, small but snug decor objects, hollow spaces meant to add appeal to your garden, an open porch with no repellents, etc. are all prime shelter zones. Talk to your neighbor about this problem. 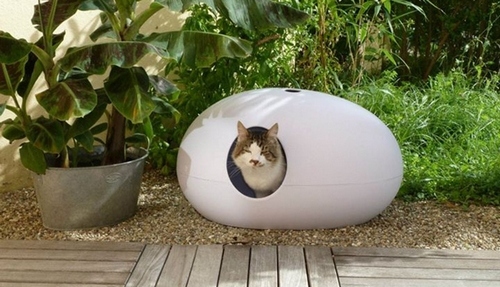 After all, you cannot get rid of a nice garden decor simply to keep their cat(s) from using it like it’s their very own government-housing option. This is a straightforward approach to keeping cats out. You can use fences to even block access points to shelter and trash zones on your side of the picket. Apply this option below a deck or porch, as well as narrow holes or gaps in your garage that cats can use to get to your yard or garden. 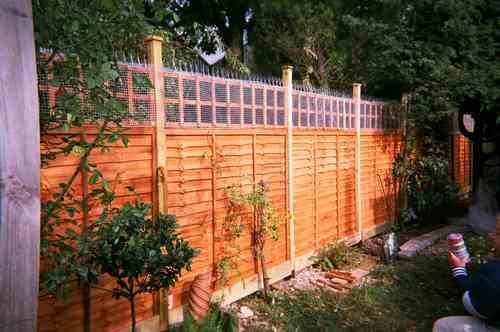 Besides, chicken wires and fences leaning out to make it difficult for cats to leap or climb are sound options to implement. 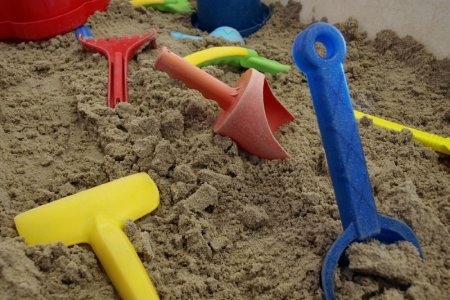 Sandboxes are sometimes a necessity or decor idea for gardens and yards, especially if you have kids. Get sandboxes that can be covered or closed tight because cats will only see it as a deluxe litter box. You do not want your kids catching zoonotic diseases by playing in areas with cat feces. If you want, you can always place a smaller sandbox near your house so as to distract cats from entering your garden. How to keep cats away? Remove all the attractive things. Several interesting garden/yard items and settings can pique a cat’s curiosity. Birdbaths and bird feeders are attractants in more ways than one. You must certainly like these garden design options to even keep them, so make sure you hang them in such a way that cats can’t access them; the birds will thank you for it. Food and water should never be kept out in the yard where cats will most certainly grab their fair share. Once they classify your porch as a food source, it will be harder to get rid of them. Repellents are a good way to keep female cats out of your garden. When they go into heat, un-spayed males will heed the call and come over, especially if you have done nothing to keep your cats that are not neutered indoors. As you can imagine, this will only add to your burdens, to say nothing of the racket. Server responsed at: 04/25/2019 2:43 p.m.